When I first spotted the small, pink can at the bottom of a beer cooler in Puerto Viejo, Costa Rica, I was reminded of the atrocity that is Sophia Coppola's horrendous champagne drink, Sophia. I had the misfortune of trying that concoction one day during an impromptu spring picnic. It was an overly sweet, overly fizzy disaster that I don't think either I or my partner could finish. 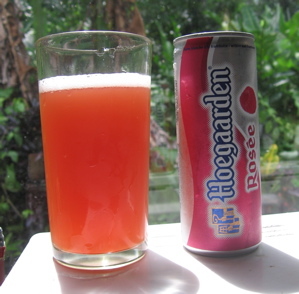 On closer inspection however this can turned out not to be the offender, but a new drink from Hoegaarden, innocently called Hoegarden Rosée. It claims to be a witbier with framboise, or raspberry. It can hardly be called a beer. I found it utterly delicious none the less. It pours a hazy rose, the cloudiness perhaps from the residual yeast, with lackluster head and minimal lacing. The smell is floral and distinctively fruity, with maybe a hint of the banana esters you would expect from witbiers. Contrary to other disastrous fruit/beer pairings, (Pete's Strawberry Blonde, Blue Moon) this one had an authentic raspberry flavor. More than a beer it taste like a light raspberry cider, a bit like Lindeman's Framboise, but lighter and more effervescent. It leaves a crisp sweetness and you tongue actually tingles after that first sip. In a word, delightful. It may be the first "chick drink" I think I have truly enjoyed. At 3% alcohol, I believe it could use a little more heat. Not a lot, maybe 4.5 or 5% and it would leave you with the appropriate burn to remind you that you are drinking a beer and not a soda. On the whole, however it was very light, very fragrant, and refreshing. I had it for breakfast and it provided a perfect accompaniment to my poached eggs and toast. Clocking in at ₡1500, or about $3, for 25cL, the cost is extravagant. If you think of similar fruity delights however like Lindeman's Frmboise, which runs about $6 a bottle, even in the states, it is not such a bad price. I prefer to think of it as my special occasion go to drink. Of course, as a wise man once said, "There is never an occasion too small to be celebrated with champagne. Why, one could even say waking up in the morning could suffice!" The same could be said of Hoegaarden Rosée. This page contains a single entry by Vera Eppard published on October 1, 2010 7:07 AM. Thailand to Malaysia: Scenes from a train | No Baggage Challenge -- Around the World with no luggage was the previous entry in this blog. Travel Skills: Learn the Language is the next entry in this blog.